Visit the global United States » Missouri » Ferguson archives for posts from all DGR sites. Hundreds of people across Texas have staged rallies across the state in solidarity with those in Ferguson, Mo., rallying for justice after the racist police murder of Michael Brown. Hundreds rallied in Austin to show support for victims of police violence. In Dallas, where police have killed several Black men in recent years, local politicians unveiled plans Aug. 18 to more thoroughly investigate police shootings. Dallas police representatives have been publicly critical of cops in Ferguson. 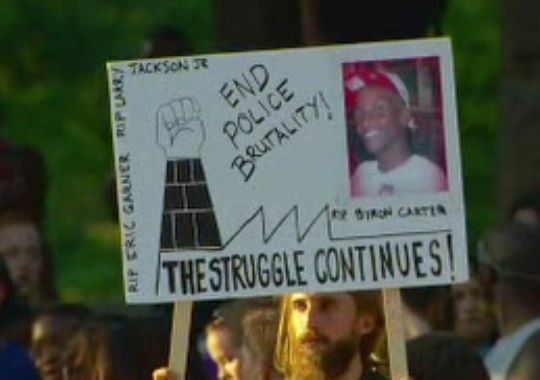 In Houston, residents rallied in front of the Houston Police Department in solidarity with Ferguson protests. More cities in Texas are expected to announce demonstrations soon.